White Cliffs of Dover form the part of the British coastline that faces the Strait of Dover and France. The cliff is part of the North Downs formation. The chalk like façade consists of pure white calcium carbonate. A black flint accentuates this facade. 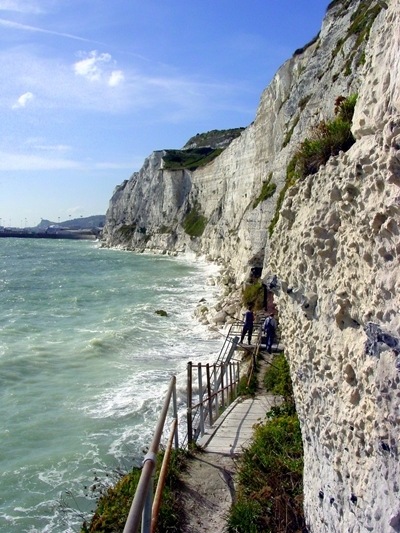 The cliff spreads across the east and west from the town called the town of Dover located in the country of Kent. Kent is known as ancient but still an important port in England. The cliff is composed mainly of soft white limestones, coccoliths, plates of calcium carbonate, which is formed by coccoliths, single celled planktonic algae and etc. Flints and quartz are found in this chalk as well. The cliff is located along the coastline. On a clear day, the cliffs can be easily spotted from the French coast. Thanks! This helped with a project I had to do.